When it comes to a summertime wardrobe staple I immediately think of white jeans and chambray. It's effortless while looking pulled together and you can dress it up or down to your desire. However, like the perfect pair of jeans that make you feel good, finding the perfect chambray can be a challenge. So if you're on the hunt for your 2016 chambray I've got you covered. I love all of those choices!! So cute an easy to throw on. Now I need to find a cute par of colored jeans to wear with a chambray top. Give me all the chambray!! That tank dress is sooo cute!! That flyaway splurge dress is so gorgeous! #3 would be a shirt on me but I would so rock it! I love chambray, so much so I'm always buying more chambray tops and then asking myself "really? who needs this many chambray shirts?" They just all seem to be a tiny bit different and when I see one on somebody else I think it's so much cuter than any of the ones I have. I'm crazy I guess. And I may buy #2 just to prove it. 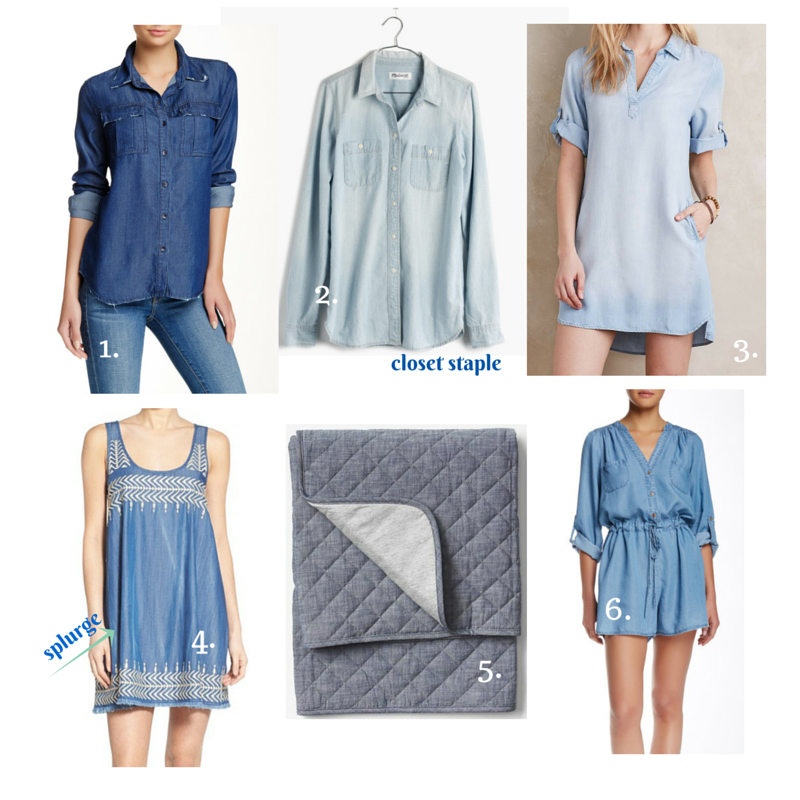 I am loving this trend and have two chambray dresses! Now if only my boys would allow me some white pants! Love me some chambray! I wish I didn't have a ridiculously long torso, because that romper is perfection! Love! I can't find white jeans that fit me. It's probably for the best, there's like one month I could wear them here before it gets too hot.